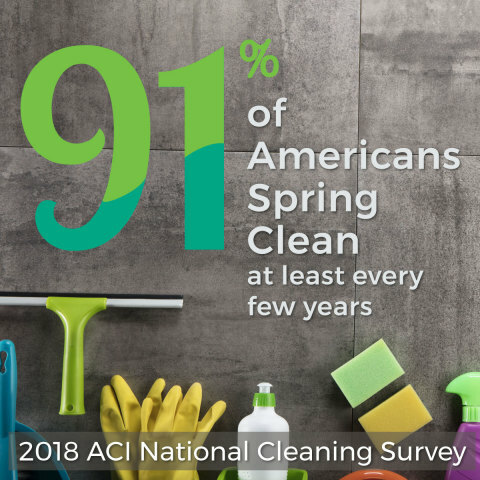 WASHINGTON--(BUSINESS WIRE)--The American Cleaning Institute (ACI) released its 2018 National Cleaning Survey, revealing that spring cleaning season is in full swing in America. Right after showering, use a daily shower cleaner while the walls are wet - no rinsing, wiping or scrubbing is necessary to keep surfaces free of soap scum and hard water deposits. Clean microwave spills soon after they happen so they are easier to remove. It's a snap to wipe them up before they harden. Find additional cleaning tips and ideas year-round on ACI’s cleaning blog, Clean and Happy Nest, at cleanandhappynest.org. To view more of ACI Cleaning Survey results, click here. The American Cleaning Institute® (ACI – www.cleaninginstitute.org) is the Home of the U.S. Cleaning Products Industry® and represents the $30 billion U.S. cleaning products market. ACI members include the formulators of soaps, detergents, and general cleaning products used in household, commercial, industrial and institutional settings; companies that supply ingredients and finished packaging for these products; and chemical distributors. ACI (www.cleaninginstitute.org) and its members are dedicated to improving health and the quality of life through sustainable cleaning products and practices. American Cleaning Institute released its 2018 National Cleaning Survey, revealing that spring cleaning season is in full swing in America.